Figure 1. One of the replicas of the Tempyō fude (天平筆) ordered by the Emperial Agency in 753 C.E. 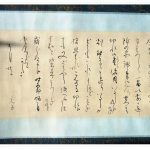 About 400 years ago, in the year 1615 during the Genna Era (元和年間, げんなねんかん, 1615 – 1624), the First Generation Fujino Unpei (初代藤野雲平, しょだいふじのうんぺい, Shodai Fujino Unpei) arrived in Kyoto (京都, きょうと, Kyōto), then the capital of Japan (from 794 to 1869), and he opened his brush workshop there. A few years later, the highly honourable title of Purveyor to the Imperial Household was bestowed upon him. He often crafted brushes for the calligraphers of the Arisugawa-no-Miya (有栖川宮, ありすがわのみや) family, one of the Sheshuu Shinnouke (世襲親王家, せしゅう　しんのうけ, Seshū Shinnōke), i.e., four branches of the Imperial Household of Japan. Until 1947, the branch was eligible to succeed to the Chrysanthemum Throne if the main line of the Imperial Family should die out. Figure 2. 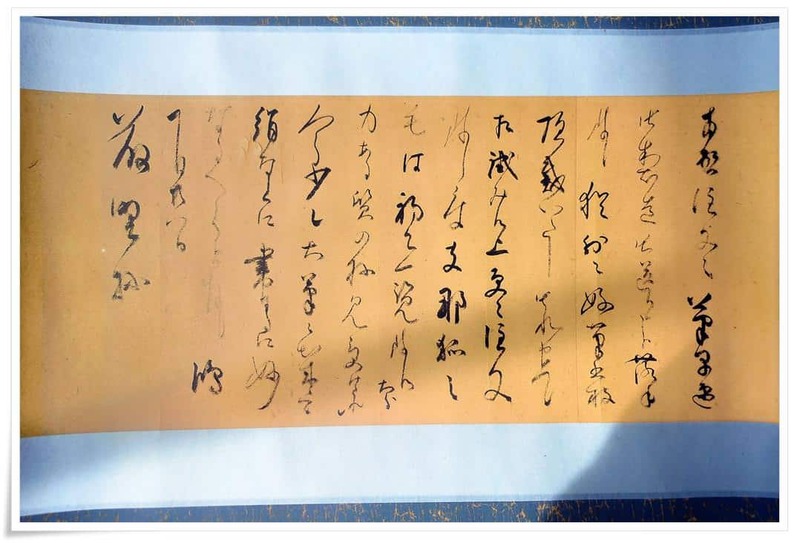 Calligraphy written with maki fude by the Prime Minister Matsukata Masayoshi (松方 正義, 1835 – 1924). One hundred years later, during the Shoutoku Era (正徳年間, しょうとくねんかん, 1711 – 1716), the Fifth Generation Unpei received a name for his workshop from Konoe Yorakuin Iehiro (近衛予楽院家煕公, このえ よらくいん いえひろ, 1667 – 1736), a Japanese court noble of the Edo period (江戸時代, えどじだい, Edo jidai, 1603–1868). 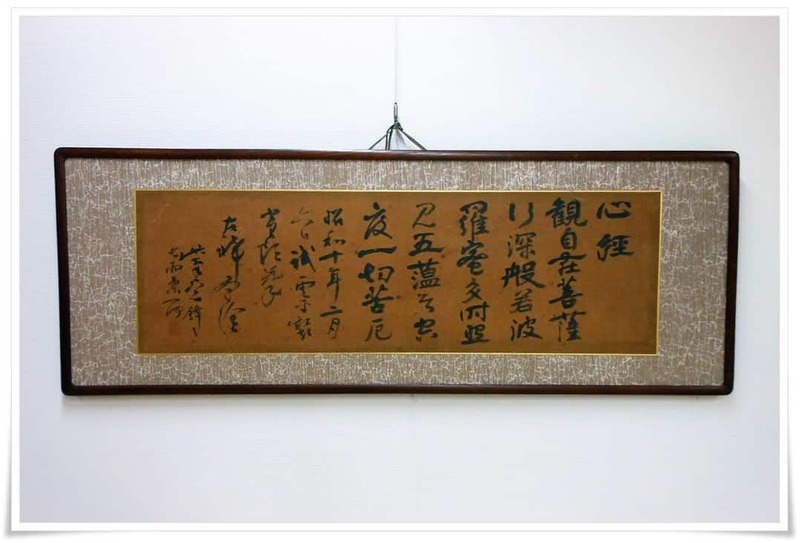 Names given to people or places that differ from their birth names is a respected and cherished custom in Far East Asia (see article on the etymology of the character 字). The name chosen by Konoe Iehiro was Hankeidou (攀桂堂, はんけいどう, Hankeidō), which literally means “climbing the wisteria tree”. According to an old Chinese legend, a wisteria tree (桂) grew on the moon, an allegory for a difficult place to reach. 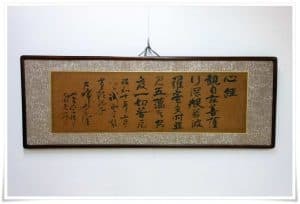 The character 攀 (攀じる, よじる, yojiru) means to climb up, “to aspire”, or “improve oneself”. Hankeidou could be understood to mean a never ceasing aspiration to climb above the challenges of one’s life, thereby becoming a better person. The workshop in Shiga prefecture (滋賀, しが, Shiga ) carries the same name into the present day. In the 20th year of the Meiji Era (明治時代, めいじじだい, 1868 – 1912), the 12th Generation Unpei (十二世雲平, じゅうにせいうんぺい, Jūnisei Unpei) received a request from his Majesty Prince Arisugawa Taruhito (有栖川宮熾仁親王, ありすがわのみや たるひと しんのう, Arisugawa-no-miya Taruhito-Shinnō, 1835 – 1895), to produce a genuine mountain horse hair brush. 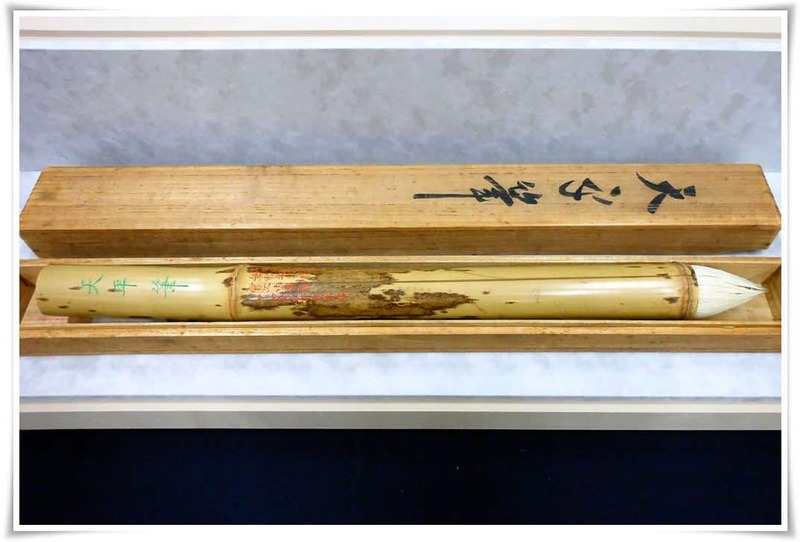 After receiving the item, the Prince is recorded to have said, “Could this brush made by Hankeidou possibly be the only one that retains the flow and elegance of our ancestors’ (writing)”? Figure 4. 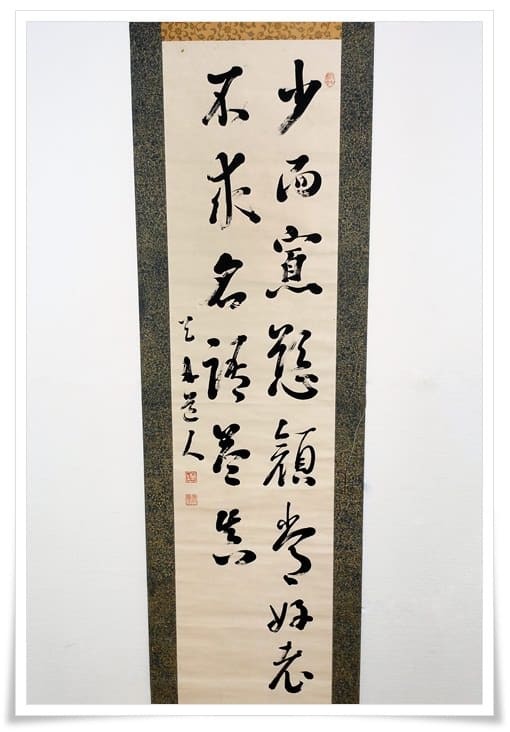 Calligraphy work by Master Hidai Shōkin (比田井 小琴, 1885 – 1948), wife of famous Grand Master Hidai Tenrai (比田井天来, 1872 – 1939), written with maki fude. In the 42nd year of the Meiji Era (1910), the 13th Generation Unpei (十三世雲平, じゅうさんせいうんぺい, Jūsansei Unpei) moved the Hankeidou Workshop to the new capital of Japan, Tokyo (東京, とうきょう, Tōkyō). The outstanding quality of the products and the reputation of the craftsmanship attracted such distinguished buyers as Prime Minister Matsukata Masayoshi (松方 正義, まつかたまさよし, 1835 – 1924), the entrepreneur Ookura Kihachirou (大倉 喜八郎, おくら きはちろう, Ōkura Kihachirō, 1837 – 1928) who laid the foundations for Tokyo Keizai University (東京経済大学), calligraphers of such magnitude as Grand Master Hidai Tenrai (比田井天来先生, ひだいてんらいせんせい), Hidai Tenrai Sensei, 1872 – 1939), the initiator of the avant-garde calligraphy style (前衛書道, ぜんえいしょどう, zen-ei shodō), and a famous koto (Japanese 13 string zither) player, Okayama Takakage（岡山高陰, おかやまたかかげ, 1866 – 1945). Figure 5. 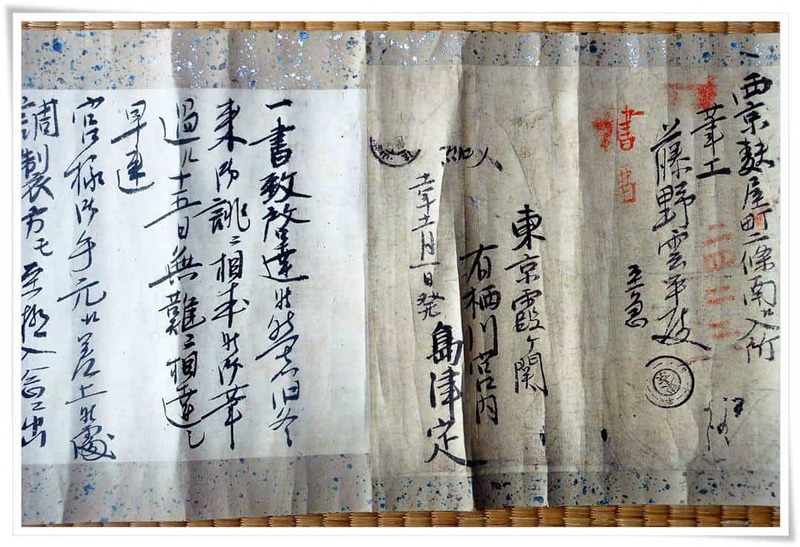 Calligraphy written with maki fude received by Hankeidō from the Arisugawa-no-Miya (有栖川宮) family in 17th century. After the dramatic events of the Great Kantou Earthquake of 1923, a decision was made to move the workshop to its present location in Shiga Prefecture. 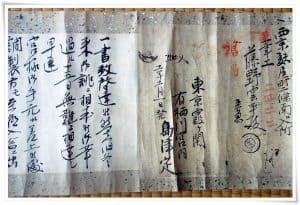 In 1966, the 14th generation owner of Hankeidou received the designation “Intangible Cultural Asset” and three years later a Ministry of Labour Award for outstanding contributions to Japan throughout its hundreds of years of existence. The year 1975 is possibly the most storied in the long and eventful history of Hankeidou. 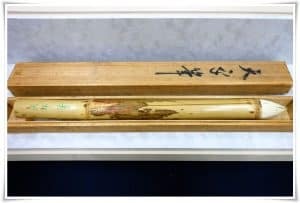 The Emperor Hirohito himself (昭和天皇, ひろひとてんのう, 1901 – 1989), together with his wife, graced the workshop with an official imperial inspection in order to experience how the brushes were being crafted. Four years later, the Imperial Agency placed a special order for a replica of the Tempyou fude (天平筆, てんぴょうふで, Tempyō fude), used in 753 C.E. during the Tempyou-Shouhou Era (天平勝宝, てんぴょうしょうほう, Tenpyō Shōhō. 749 – 757) for the Large Buddha Statue consecration ceremony (during which eyes are inserted into the head of the statue, being a symbol of the enlightenment by investing it with a soul). Those brushes were to be made for the Shousou-in (正倉院, そうそういん, Shōsō-in) in Nara (奈良, なら, Nara), the Imperial National Treasure House which holds artifacts and other crafts of the Tempyō period connected to Emperor Shoumu (聖武天皇, しょうむてんのう, Shōmu Tennō 701–756) and Empress Koumyou (光明皇后, こうきょうこうごう, Kōmyō Kōgō, 701–760). Figure 6. 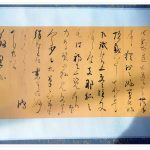 A letter written with maki fude, sent to Hankeidō by Grand Master Hidai Tenrai (比田井天来, 1872 – 1939). In 1995 Crown Prince Naruhito (皇太子徳仁親王, こうたいし なるひと しんのう, Kōtaishi Naruhito Shinnō, 1960 – present) and Crown Princess Masako (皇太子妃雅子, こうたいしひ まさこ, Kōtaishihi Masako, 1963 – present) made an official imperial inspection of the workshop. Later on, the art of making unpei fude was filmed by NHK, the national television channel of Japan. The program was titled “Traditional Japanese Craftsmanship” and was broadcast nationwide. Figure 7. 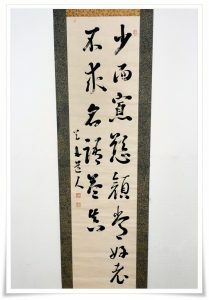 A calligraphy work of Grand Master Hidai Tenrai (比田井天来, 1872 – 1939), written with maki fude. In 2009 photographs of the replica brushes made for the Arisugawa-no-Miya family from the 17th century were included yet in another TV programme, entitled The Imperial Household Album. Some of the types of brushes included the maki fude group whose technique was developed during the Tang dynasty (唐朝, pinyin: Táng cháo, 618 – 907 C.E.). More details will be forthcoming in Part II. The Hankeidou Workshop does not exclusively manufacture maki fude. 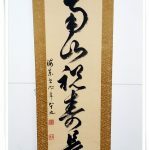 Other types of brushes make up a lengthy list, speciality brushes such as “water brushes” (水筆, すいひつ, suihitsu), a core-less brush which soaks ink with its entire tuft and not only the stomach of the brush as well as traditional calligraphy brushes made from all types of hair including mountain goat, weasel, horse, and raccoon, among others. All brushes are hand-made and of exquisite quality. Figure 8. 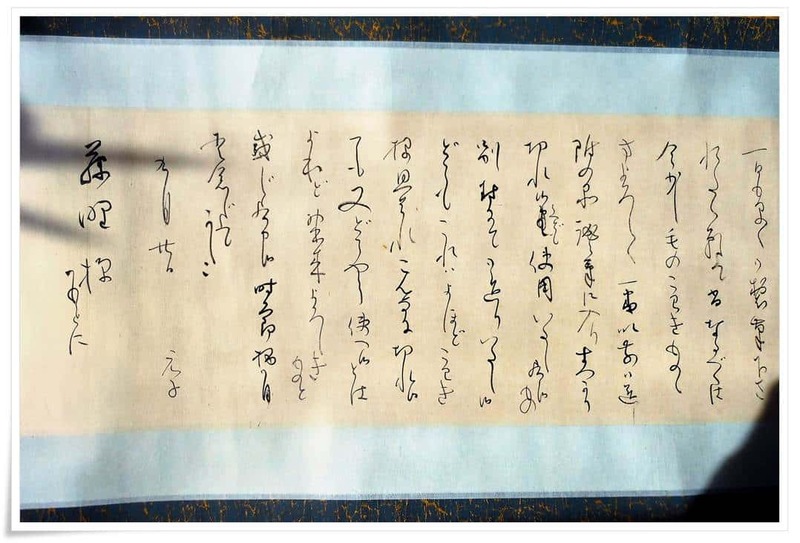 A letter written with maki fude received by Hankeidō from the Arisugawa-no-Miya (有栖川宮) family in 17th century. The history of Hankeidou is eventful, and the reputation of this temple of traditional Japanese craftsmanship is truly remarkable. 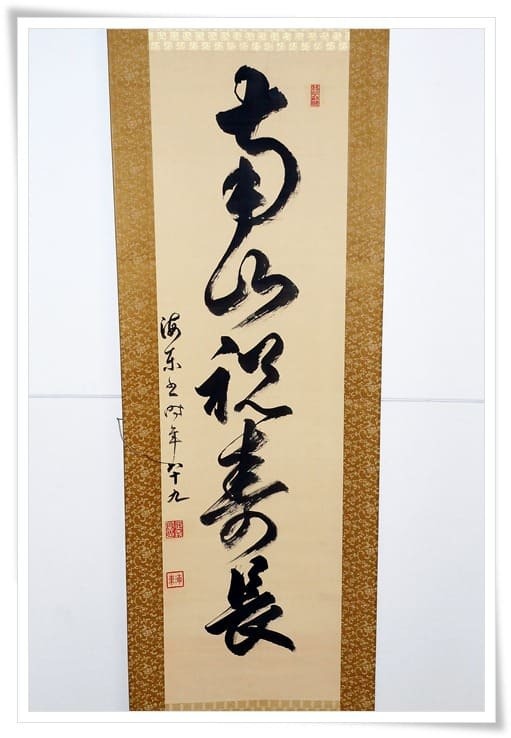 The Beyond Calligraphy team, are truly honoured to be able to share this information in English with readers worldwide for the first time and hopefully to do for the Hankeidou internationally what NHK did for them within the islands of Japan. I would also like to thank Fujino Junichi (藤野純一, ふじのじゅんいち, 1983 – present), son of the 15th Generation Unpei (十五世雲平, じゅうごせいうんぺい, Jūgosei Unpei), who kindly took the time to write an article in Japanese and provided us with some very interesting pictures. In Part II, we will discuss how a maki fude is crafted and the characteristic features of this particular brush. Thank you so much! The part 2 is coming next Monday. I have just finished translating it from Japanese. It will provide more details about those unique brushes. Hope you will enjoy it as well!